Congratulations to Jonathan Duhamel! 2010 WSOP Main Event Champion! 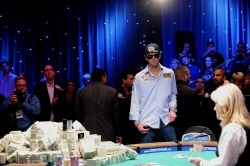 Jonathan Duhamel: 2010 WSOP World Champion! "Ole! Ole! Ole! Ole!" 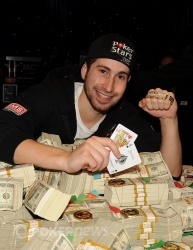 Those were the chants ringing loud and proud from Jonathan Duhamel's cheering section as his pumped two large bricks of cash over his head and into the air while posing for photos behind HIS pile of cash topped with HIS World Series of Poker Main Event championship gold bracelet! The chanting rang on and on for several long minutes while the champion soaked it all in, making sure to embrace with John Racener and have a few words with him as well. Back on July 5, the first group of runners packed into the Amazon Room here at the Rio All-Suite Hotel & Casino to embark on their 2010 WSOP Main Event run. After all four days of registration was complete, the field grew to 7,319 total entrants and became the second largest Main Event ever. Four months later, a champion has been crowned and it is Canadian Jonathan Duhamel who stands atop them all! Duhamel walked into the Penn & Teller Theater on Saturday morning as the man to catch with a big lead. He eventually got a little short, then went on a tear to take an even more monstrous chip lead into this final showdown. Now, he holds a lot more than just chips with $8,944,310 in his pocket! Heads-up play lasted 43 hands before Duhamel could finally finish off John Racener, who took home $5,545,955 for his runner-up finish. There wasn't too much to be said about this heads-up match that had Racener needing to overcome more than a 6-to-1 chip deficit when it began. Racener could only manage one double up off of Duhamel when he woke up to pocket queens in the big blind after he was shoved on. Duhamel had shoved with the . Racener's queens held and there was some hope. That one double up would be the only all-in confrontation that Racener would win though because the next time the two put all of the chips in, Duhamel left with the title. Duhamel shoved all in on the final hand with the . Racener was too short to pass it up and called off the last of his chips with the . After the board ran out , Duhamel was swarmed by a sea of red Montreal Canadians jerseys. His fans then hoisted him high into the air and bounced him up and down. On hand to present the gold bracelet to Duhamel was none other than last year's champion and youngest Main Event winner ever Joe Cada. As Jack Effel announced and Duhamel was handed the bracelet, confetti fell from the sky with his friends and family chanting away. Duhamel said a few words to everyone here, but was mostly thankful to everyone and short on words, clearly in shock from what has just taken place. "Thank you to everybody for being here, it's a dream come true," Duhamel said. "I don't know what to think, I don't know what to say," he finished. Don't worry Duhamel, we completely understand. 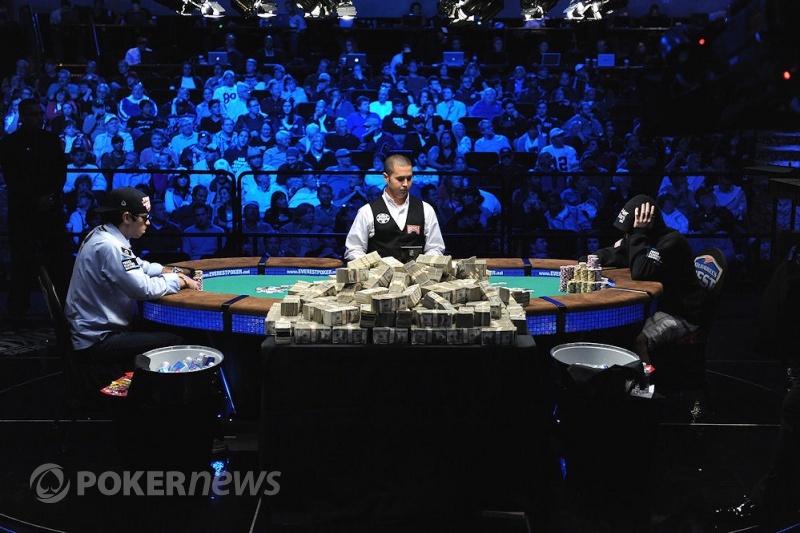 That officially wraps up PokerNews' coverage of the 2010 World Series of Poker. Congratulations to all of the winners, the players who reached the November Nine and especially to the new champion Jonathan Duhamel! It was another great year on the felt and we would like to thank everyone for following along with us. Until next time, you can bet that you'll find us at the bar. Hopefully Duhamel's buying! Hand #262: John Racener Eliminated in 2nd Place ($5,545,955); Jonathan Duhamel Wins 2010 WSOP Main Event! Jonathan Duhamel has the button. It's over! Duhamel runs back to his rail, many of whom are dressed in Montreal Canadien jerseys. They lift him off of his (un-shoed) feet in a sea of red and start chanting "Ole! Ole Ole Ole! Ole! Ole!" For the first time in WSOP history, the Main Event champion is a Canadian! Racener is consoled by his own fans. For 2nd place, he gets $5,545,955. He moves all in for 13.15 million and wins the pot. Duhamel shoves again. Racener thinks about it this time but folds again. He limps into the pot, then folds to another shove from Jonathan Duhamel. Racener is down to 16.15 million. Duhamel moves all in. John Racener folds. John Racener has the button and gives Jonathan Duhamel a walk. Duhamel limps in. John Racener checks. Both players check a flop of . Racener also checks the turn. Duhamel bets 1.7 million and takes down the pot. The players are on a break.